We've all had a nail break off and yelped in pain when the crack goes below the tip of the nail bed —and the further down the nail bed the injury goes, the more it hurts. But for some reason, many people underestimate the amount of pain a dog is in when a nail breaks or even falls off. Dog nail injuries are so painful that they often require a trip to the vet. If your dog split a nail or if your dog lost a nail altogether, consider how painful it would be if you experienced a similar nail injury when deciding whether or not to treat the injury at home. Before you do anything else, evaluate the severity of the injury. If the dog lost his toenail completely, you might be able to treat the injury at home. If the nail is still in place below the injury, it will need to be removed up to the area where the break occurred. In most cases, this means you'll need to take the pup to the vet, but if it is close to the tip of a long nail or if it is only hanging on by a thread, you may be able to remove the nail yourself according to Wag n' Woof Pets. Also, take your dog's temperament into account. If your dog starts snarling when you cut her nails on a good day, you should probably go to the vet to have the nail removed if it has not broken completely off. If she is super-patient and calm no matter what you do to her, you might be able to treat the broken nail at home. Remember that even a sweet family dog may lash out when in extreme pain. You don't need to take the whole thing off, but you do have to remove the nail up until the broken point so it can grow back healthy. If it has a crack that goes up past the main injury, you have to remove the nail all the way to the top of the crack. Again, as Petful explains, this is a job best reserved for the vet unless the injury is at the tip of a very long nail or is dangling by a thread. Even if your dog is extremely calm and will let you do the nail removal yourself, remember that if it's not dangling, you are very likely to cut the flesh inside his nail. This will hurt your pooch immensely the same way it would hurt if someone cut the inside of your nail bed. If you remove the remainder of the broken nail yourself or if the nail fell off on its own, the chances are that the quick (the flesh under the nail) will bleed. You need to stop the bleeding and can do so by either applying a styptic pencil or powder or using a household product such as cornstarch, baking soda, or flour to stop the bleeding and applying pressure to the wound. 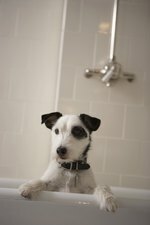 Bathe the paw in warm, soapy water and be sure to clean out all traces of dirt and debris. You might use a bulb syringe filled with water to help gently spray out any material stuck to the toenail. Spray a pet-safe antiseptic on the toe to disinfect it and help relieve the pain. Finally, bandage the paw with a loose bandage and first aid tape. You might also place a clean sock over the paw and tape it in place because some dogs are less likely to mess with a less-restrictive sock on their paw than a bandage. If your dog messes with the bandage, you will need to make her wear a plastic cone around her head until the wound heals. Change the bandage daily and look out for signs of infection such as oozing, increased bleeding, pus, heat from the toe, or swelling of the toe. If the toe becomes infected, take your dog to the vet as soon as possible. When a vet removes a broken nail, she will sedate your pet during the nail removal process and send you home with pain medication to help keep your best friend out of pain while he recovers. This can save your dog from a lot of suffering. The vet will also clean, disinfect, and bandage the wound to prevent infection and may even send you home with antibiotics to prevent infection before it starts. Generally speaking, if the broken toenail is anywhere past the very tip of the toe and you can afford the treatment, going to the vet is the best way to treat a dog's broken toenail according to Pet Helpful. Dew claws, the weird nails found higher up on the dog's foot (they appear somewhat like thumbs), are more susceptible to breaking than other nails because they are more loosely attached. While the process for treating them is similar to that of any other nail, your vet may opt to remove the dew claws altogether if they are injured since they ultimately serve no purpose and are at risk of getting injured again down the line. If your dog has a broken dew claw, be sure to ask your vet if you think removing the dew claws is advisable.